The potato leafhopper is an important insect pest of alfalfa, fruits, and vegetables. 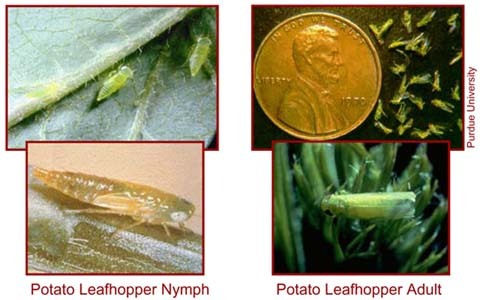 Though its host range extends to over 100 plants including alfalfa, soybean, beans, apples, potatoes, and grapes, the potato leafhopper causes the most significant amount of injury to alfalfa and clover. Yield losses of up to 50% may result in severe infestations. Potato leafhoppers often go unnoticed until injury symptoms appear, which is much later than when economic levels of the pest occur. Potato leafhoppers are small (1/8 inch long), wedge-shaped insects. The body of the insect is widest at its head and narrowest at its wing tips. Potato leafhoppers have piercing andsucking mouthparts, which allow them to remove nutrients from host plants. This species of leafhopper is pale green with a rowof six white spots located behind the head. In order to observe these small white spots very well, a hand lens may be required. Immature potato leafhoppers, or nymphs, are smaller than the adults and yellow to pale green. Adults have whitish or translucent wings, while the smaller nymphs or immatures are wingless. When disturbed, adult leafhoppers readily jump or fly away. The hind legs are long and explains the excellent jumping capabilities possessed by potato leafhoppers. Leafhopper nymphs can not fly, yet are very quick and move sideways across the leaves when disturbed. Potatoleafhopper eggs are white, slender, and very small, approximately 1/24 inch long. Potato leafhoppers cannot survive the winter in Illinois. 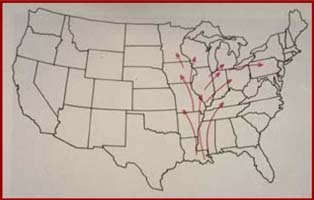 Infestations require spring migration from southern Gulf Coast States where reproduction occurs throughout much of the winter. Female potato leafhoppers live approximately one month and during this time insert two to three small white eggs per day into the stems and larger leaf veins of suitable plants. The nymphs hatch from the eggs in 7 to 10 days. Immatures pass through five nymphal stages, taking approximately 2 weeks for the nymphs to become adults. The entire life cycle requires about 1 month to complete and three to four generations of leafhoppers may be observed each year in Illinois. During the summer months, it is common for generations to overlap. Potato leafhoppers can be found in fields until the first killing frost in the fall. Both potato leafhopper adults and nymphs may cause injury to plants. The chief concern for alfalfa producers is a type of injuryreferred to as "hopper burn." This effect is caused by the removal of fluids from vascular tissues and the simultaneous injection of toxic substances into the plant. An early symptom of "hopper burn" is characterized by a V-shaped yellow area on the leaf tip. 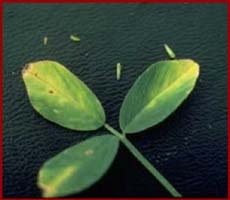 Leafhopper damage may require a few weeks before symptoms begin to show, and consequently older leaves generally display the "hopper burn" symptomology. Yield loss generally occurs before symptoms are readily seen. Symptoms should not be confused with disease and nutritional deficiencies, inwhich yellowing of foliage typically begins at leaf margins. Boron deficiency, although displaying similar leaf symptoms, usually is limited to the youngest leaves. The damage potential of potato leafhopper is greatest during dry years. Field margins often display the first signs of leafhopper injury and are frequently the most severely damaged portion of a stand. Feeding on the new regrowth following the first hay crop may severely stunt or slow further plant development. The second and third cuttings of hay in Illinois are susceptible to moderate to severe injury from potato leafhoppers. The first cutting of hayis seldom damaged by potato leafhopper in Illinois. Severe leafhopper injury can reduce both theprotein and vitamin A content of alfalfa. This will result in asignificant loss in the nutritional value of hay for livestock. If injury occurs late in the season, plants may enter winter dormancy in a weakened state. Potato leafhoppers may also be found in soybean, snap bean, and potato fields. Injury caused by the leafhopper results in a yellowing at the tip of the leaves, in a V-shaped pattern. Heavy infestations may cause stunting of plants and cupping of leaves. In many instances, leafhoppers found in soybean fields rarely cause significant injury. Movement to soybean fields by the potato leafhopper generally occurs when a nearby alfalfa field is cut. Though less common, potato leafhoppers may also be a pest in fruit orchards in Illinois. In apples, potato leafhoppers may be a threat to young, tender foliage of young fruit trees. Injury to fruit trees is similar to that found on other host plants of the potato leafhopper. 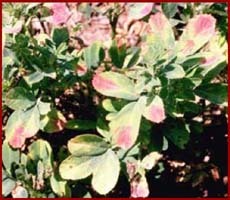 Injured foliage has the characteristic V-shaped "hopper burn," severe injury may cause the entire leaf margin tobe affected. Injured leaf margins generally curl downward. Other leafhoppers that may be present in orchardsare the white apple leafhopper and rose leafhopper. Alfalfa:In order to effectively monitor alfalfa for potato leafhoppers, a 15-inch sweep net is required. At a minimum, hay should be sampled once each week following the first cutting of hay. This weekly schedule should be maintained since leafhoppersare very capable of moving from field to field. Avoid sweeping field borders or during cold and wet conditions. Sweeping wet foliage produces results that are not reliable estimates of the damage potential within a field. Twenty sweeps should be taken in each of five areas of a field. Make sure that representative portions of the field are sampled. Avoid making sweeps along field edges. 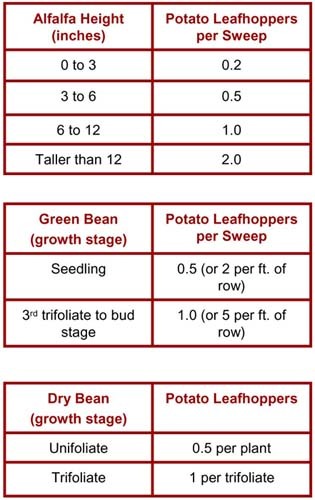 Record the average number of potato leafhoppers (adult and nymphs) per sweep in each of the five areas of the field. After all areas have been sampled,calculate a field average of potato leafhoppers per sweep. Collect 20 alfalfa stems at random from a good cross section of the alfalfa field. Care should be taken to avoid looking directly at stems that are to be chosen; calculate the average stem length and plant stage. 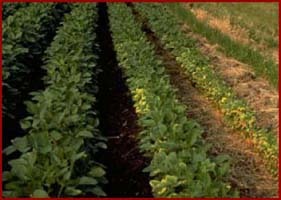 If an insecticide application is necessary, based on these suggested guidelines, plants should not be sprayed during the bloom stage, but instead, harvested early. Soybeans:It is recommended to treat for potato leafhoppers in soybeans when leafhoppers are numerous and the edges of the leaves exhibit severe injury. Control may be warranted during bloom when there are six or more leafhoppers per plant orduring pod formation when 13 or more leafhoppers are found per plant. Much of the management of the potato leafhopper in alfalfa has relied on scouting, cultural control, and the use of insecticides. The key management strategy for the potato leafhopper relies on vigilantscouting. By scouting alfalfa fields and conducting sweep samples, a grower can monitor the number of leafhoppers and detect economic levelsbefore symptoms occur. Research has proven that economic damagehas already occurred if leafhopper injury is visible. Waiting until symptoms are visible in the field before taking action is not recommended. If economic thresholds are reached just prior to cutting, harvest the alfalfa, and then monitor the regrowth to determine if treatment is needed. 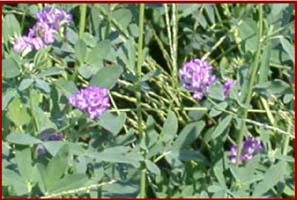 Early harvest of alfalfa has been the primary control method of reducing potato leafhopper egg, nymph, and adult populations. As hay fields are cut, adult potato leafhoppers fly out of the field. Nymphs remain in the field, but are unable to survive without food. When infestations are above economic thresholds and early harvest is not an option, insecticides may be used as the primary control method. Avoid spraying during the bloom stage. Potato leafhopper resistance or tolerance in alfalfa hybrids is based on the presence of glandular hairs on the leaf surface of the plant. These hairs act as mechanical barriers to the leafhopper feeding, preventing them from reaching the leaf with their mouthparts. This same type of tolerance is also functional in soybeans. Most soybean varieties have highly pubescentleaves, but some varieties lack hair on the leaf surface, especially food grade soybeans. Potato leafhoppers may be a threat to very young soybean plants or whenalfalfa fields are adjacent to the soybeans. As alfalfa fields are harvested, adult leafhoppers maymigrate to soybean fields. Natural control, such as predators and parasites, play a very minor role in potato leafhopper control. During cool and moist conditions, a fungal pathogen, Zoophthoraradicans,may aid in suppressing leafhopper populations. Heavy rains may help knock down leafhopper numbers, however, summer storms may also bring in potato leafhoppers on wind currents. Management in orchards and vegetable crops relies on the use of insecticides when economic levels of potato leafhoppers are reached. Potato Leafhopper Management in Alfalfa, University of Nebraska. Potato Leafhoppers, University of Kentucky Entomology. Vegetable Insect Management with emphasis on the Midwest.